Penang is filled with more and more interesting tourist attractions! Now with the opening of The Habitat located at Penang Hill, we can get closer to nature and learn more about flora and fauna in one place. The Habitat just launched earlier last year and further added to the current park, there were more and more activities to do now such as Tree Top Walk, the next coming disabled-friendly suspension bridge and much more are also coming up. We have visited The Habitat recently and found our trip really interesting as we have opened our eyes to the habitat of flora and fauna here in Malaysia. To get up to The Habitat, first, you need to take the funicular train to get up to Penang Hill that comes with a lovely view. You can refer to the below price list for your reference. The Habitat opened to the public last year and attracted quite a number of visitors since then. 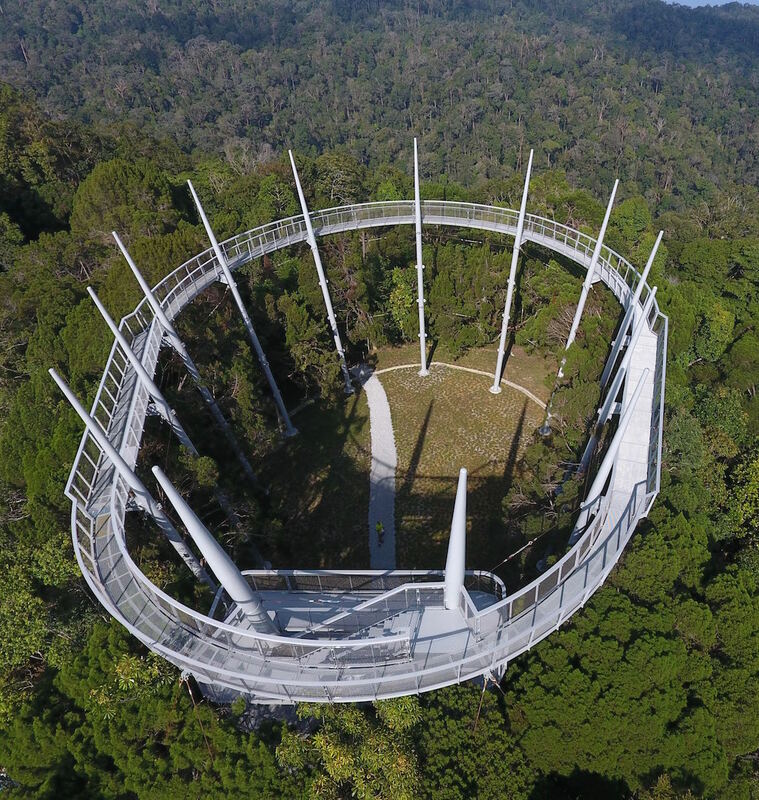 The Habitat is a world-class eco-tourism facility located on the fringes of a 130-million-year-old virgin rainforest on Penang Hill. This rainforest is untouched and precariously exists side by side with urban Penang and its environs. Senior citizens above 60-year old or students that come with student cards are also entitled to discount at only RM30 per ticket. Family package(2 adults + 2 kids) is priced at RM130. It is good to be able to see the horse stable that was there during the past still well maintained and now it is part of The Habitat. The tickets not only include the visit to The Habitat, it comes with a guided tour where the tour guide will show you around the park and also fill you up with knowledge about flora and fauna whenever you see any bugs, animals like monkeys, squirrels, plants, trees and many more. The Habitat is a home for flora and fauna that commonly seen in the rainforest in Penang. You can spot all sorts of bugs and animals like squirrels, monkeys, birds and much more roaming around freely. This is not a zoo so you will never see animals get caged, but you are the one visiting the jungle and get close to them. There are numerous tropical trees that you can only find them in Asia countries. All those trees on Penang Hill have been existed for few centuries and still well maintained. Most of the trees are being labeled and fill with information. I strongly encourage you to wait for the tour guide for a guided tour so that you can really enjoy this park to the max. Every part of this park housed a different species, different trees and only the Naturalists able to differentiate and show you exactly where they are. It is really a fruitful trip not only you relax and get closer to nature but also get to learn about the flora and fauna in Malaysia. Musang Pulut, the civet cats are also commonly spotted in The Habitat. Since this place has got so many plants and flowers, butterflies are also commonly seen at The Habitat. They come in different types, colours and sizes. A beautiful butterfly-looking flower was spotted. There were also a few installations of these swings around the park. Whenever you get tired or lazy, you can just sit back, relax and enjoy the nature with fresh air. Don't forget to capture some beautiful moments too! Beautiful flowers spotted around the park. A weird looking tree, it has got fur covered around the branch. I kinda like this leaves below, it looks like some kind of printing on your t shirt isn't it? Some holes were spotted and the tourguide told us that those are houses for the taratula spider. Monkeycups are common in Penang Hill too, you can spot a lot of them in The Habitat. The park map and informations are available all around the park so you don't have to worry that you will get lost. The whole park is quite huge, but it is very convenient as the roads were built properly even the wheelchairs can also access to anywhere in the park. There are different themed garden in The Habitat and I would like to mention this Purple Garden in particular because the plants in there was just amazing! These flowers are too cute! When you are too tired from walking around the park, you can also choose to take a rest at the cafe inside The Habitat, On The Hill. On The Hill is a gift shop and also housed a small cafe serving a limited selection menu to all the visitors. You can find all sorts of souvenier including terrariums, postcards at On The Hill. Not to forget that you will get discount for buying stuff here with your entrance ticket! We were also lucky that we met the small star, Gregg Koay. The little Sunny in local film "You Mean The World To Me 海墘新路"
They are serving not only light food like what we had below, but pasta and other food are also available on the menu. It was such a shame that we didn't get to enjoy the top attraction in this park, the Tree Top Walk that gives you a beautiful view. It was raining and thunder at the top of Penang Hill hence we had to miss it but will definitely come back for it next time! It was a lovely trip for all of us and we enjoy this park very very much. Many thanks to The Habitat for having us and thank you for all the arrangements.